There two motives behind this viz. The most simple one is because lists of names make me dizzy and visualisations help me untangle multiplicity. 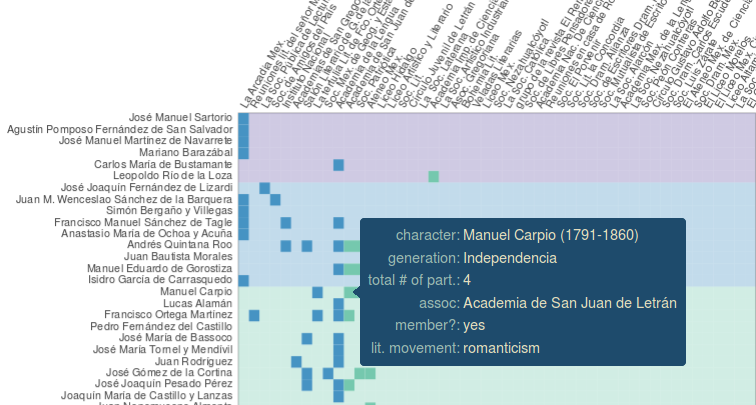 After reading Alicia Perales two-hundred-and-something book on Literary Associations in Mexico during the 19th century I couldn’t tell any more who-was-where-when, and as reading-comprehension exercise I wanted to visualise all those names and get a better sense of those unmanageable lists. The other not-so-simple-slash-more-academic reason is that I have always wondered which groups and conditions define what is “literary(-ish)”. More specifically, I was particularly curious about which groups and conditions defined what was literary in the 19th century in Mexico –a nation that was being invented as such in that same century. Inspired by the lectures of Pascale Casanova and Pierre Bourdieu, I decided to find out, one of the aspects that modelled the literary field in Mexico: namely the literary associations. There are three main reasons why I say these groups in fact “modelled” the field: 1) universities did not offer a literary career, and many writers were formed in literary associations (they would bring their texts to the associations’ sessions, read them aloud, and get feedback from their peers); 2) literary associations were a hub of power: many associations had their own literary magazines, and some even acted as censors of plays. However, capturing a panoramic of this was no piece of cake. As you might know if you know anything about associations in Mexico, is that everyone wants to make their own and thus, also in the 19th century, there were hundreds of them. One way to get around the complicated diversity of things, is through classification, and fortunately I didn’t have to reinvent the wheel. In 2005 Belem Clark de Lara, the head of an ambitious editorial project on 19th-century Mexican literature, asked herself how to classify these diverse groups, and she decided to follow Alicia Perales’ approach and group writers according to the prevailing literary movement of their time. In that same book, but in another chapter, Fernando Tola de Habich (informed by the attempts of many others before him) decided to cluster writers according to their generation. After reading the multiple discussions about the subject I was like: why don’t we try both? And that’s the story of how that super-coloured visualization came to being. The first thing you need to know about this graphic is that writers and associations are ordered chronologically; the former, from top to bottom, the latter, from left to right. The second important thing to know is that the colour on the background changes every time a new “generation” group begins according to Tola’s division which you can find at the end of the post. Finally, the strong colours appear each time a character was member of a given association. Each different colour represents each literary movement as proposed by Perales/Belem Clark de Lara.